September is here & Autumn is in the air! And so starts the cold and flu season. That's right, while you're thinking about pumpkin spice & cozy fires, those viruses are planning their attack! A few years ago, my family spent much of the fall and winter passing around some sort of virus. With 8 people in our household, this meant weeks of illness. I knew I had to do something to break this cycle and keep us healthy. I'd made bone broths for years and always keep them going in the cooler months (I'm not up for hot soup much in the Summertime). I love sipping on a mug of broth in cooler weather and using it as a base for soups & gravies. Then I read about adding certain, special ingredients to broths to sort of super charge them and help keep us healthy. Fall & winter broths always included onions, garlic, ginger, sage, rosemary, and/or thyme. These are all wonderful, flavorful herbs that can help your body fight off viruses but they just weren't enough. It was my mother who introduced me to the herbal world. She had cancer and was searching for more natural alternatives to heal herself. This was pre-internet and before Amazon's huge book selection, so information was hard to find. Mom would send me newspaper clippings on herbs and handouts from herb stores she came across. During my more recent research to help keep my family healthy, I came across 3 special ingredients that DO actually help keep us well through the cold & flu season. These special ingredients meld well with gelatin & collagen rich broths. The long, slow simmering (or quick, if you use a pressure cooker or Instapot!) used to make broth is also perfect for extracting, or decocting, as the herbalists say, the special compounds in these ingredients that keep our immune systems humming! My 3 favorite super immune boosting ingredients all have special compounds that help keep our immune systems operating at its peak. They are also inexpensive (I spend less than $100 a year on them for my large family) and store easily at room temperature on a shelf or in a drawer. The best part? They are super easy to use! An herb long used in Chinese medicine for its energizing and tonic properties, it is used to prevent and treat long-term infections including chronic colds, recurring flu, and various viruses. It is particularly energizing for the lungs and stimulates the rebuilding of the bone marrow reserve that supports and regenerates the body's "protective shield"! So...if you are prone to lung infections and bronchitis, Astragulus is for you! All you need are a few woody sticks of Astragulus to drop in your broth when it firsts starts to simmer. All edible mushrooms are known to have immune boosting properties. 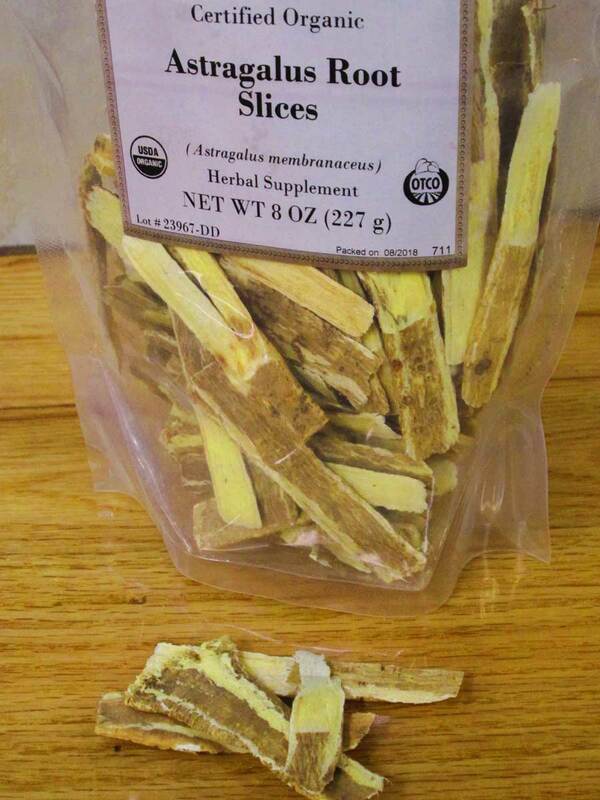 Reishi, a hard woody mushroom, has been used in Chinese medicine for centuries. Reishi is one mushroom that has been studied pretty extensively. Reishi is known to up-regulate the immune system. But it also can down regulate the immune system. Reishi is known as an adaptogen. This means that it can kick your immune system into high gear for fighting colds and other viruses like the flu. But Reishi will also tone down your immune system if it is overacting, as our immune systems do when we have autoimmune diseases. Pretty cool, isn't it? And Reishi also happens to grow in the Eastern U.S., although I have never harvested it myself. Add a slice or two of Reishi when you get your broth boiling and simmer it for hours to get the most immune modulating benefits from Reishi. Digitata is a Atlantic Kelp, Kombu, a Pacific one. The latter, Kombu, is used in Japanese Dashi, a delicious broth by which all Japanese chefs are judged. Digitata & Kombu are relatives and have similar properties. These seaweeds or, sea vegetables, add a wide variety of nutrients including iodine to nourish the thyroid and other iodine loving organs in our bodies (and there are many!) Without iodine our immune systems do not function well. Yeah, yeah, I know about iodized salt. Sadly, the form of iodine in commercially iodized salt is not optimized for our bodies. The the iodine from Digitata or Kombu is! Digitata & Kombu also contain alginates needed for strong immune function. These alginates also help remove heavy metals and radioactive isotopes from the body. I promise seaweed adds no “sea” or “fishy” flavor. Just lots of immune boosting goodness. Add a 4" length of this seaweed at the beginning of your broth making. Check out Foggy Knob Farm's pork and lamb pages to learn how you can get a stash of bones for your Immune Boosting Bone Broths. These herbs are not used to “cure” colds and the flu, but are to be taken in smaller amounts every day, much like the health tonics of old. This is how they work best. By incorporating Astragulus, Reishi, and Digitata or Kombu into our broth pots every week and using that broth when cooking nourishing food every day, we easily incorporate these immune boosting herbs into our daily meals! 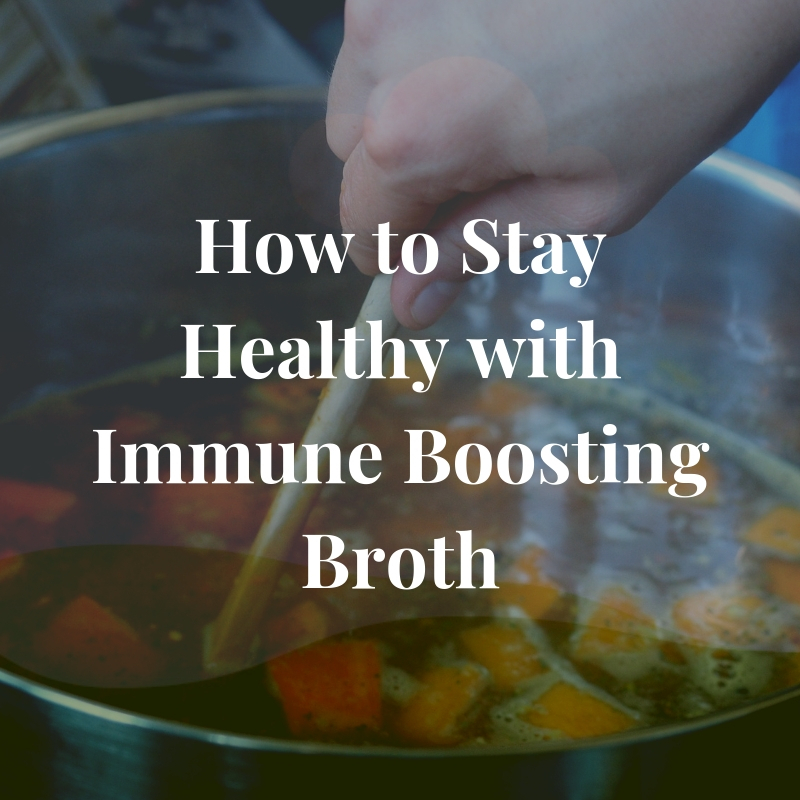 I try to cook a pot of broth weekly to sip on if we do get sick or to use in soups, gravies, and other recipes to add immune support to our diets every day. Remember, all these ingredients work best when taken often in small doses before we get sick. So be sure and keep them on hand through the winter months, when they are needed most. Of course, Lamb Broth is particularly good for you! If you aren’t sure how to make your own Lamb Bone Broth, then click here to get your own pot simmering! And if you aren’t sure how to use your broth or don’t care to sip on it, here are a few lamb recipes that incorporate this Immune Boosting Broth! Do you have friends or family that could use an immune boost? Forward this post to them or share it on Facebook. In case you missed it, the Instant Pot is making kitchen history. Its entrance on the home cooking scene a few years ago has people cooking at home again. You can make a delicious, nutritious restaurant quality meal at home in minutes with minimal effort and for a fraction of the cost! The Instant Pot makes cooking so easy even my work-a-holic little sister is making gourmet meals at home these days. You and I already know how quick and easy lamb is to prepare. Why not couple some yummy grass fed lamb with the Instant Pot? This recipe comes from one of our wonderful (and smart!) lamb customers. She’s quite the gourmet! And this recipe is simple & delicious. Almost instant too. Sprinkle chops on all sides with salt & pepper. Sauté the chops your Instant Pot using the Saute function. Add red wine and cook for a minute or two while scraping any bits of browned meat up from the bottom. Return browned lamb chops to Instant Pot. Cover and lock lid. Select Manual/Pressure Cook and cook at high pressure for 28 minutes. Once cooking is complete, release pressure by using the natural release function, approximately 20 minutes. All you need is a salad and you’re ready to eat! Thanks for the recipe, Michelle! The unassuming lamb shank holds a great secret: it’s loaded with gelatin! And gelatin is important for keeping your joints strong and limber! It’s also delicious and a perfect cut of lamb for the Instant Pot. Sprinkle lamb shanks all over with salt and pepper then dredge them in flour. Using the Instant Pot Saute function, heat oil or ghee and brown the lamb shanks on all sides then removed them from the Instapot. Add onion to the Instant Pot and saute until translucent. Add ginger and garlic and cook for another minute. Turn off the Saute function. Return shanks to Instant Pot and add the tomatoes, carrots, apricots and raisins. In a small bowl, whisk together the orange juice & honey and pour over the lamb shanks. Cover and lock lid. Select Manual/Pressure Cook and cook at high pressure for 35 minutes. Once cooking is complete, release pressure by using the natural release function. * Adapted from the Good Housekeeping Instant Pot Cookbook. Serve your lamb shanks in bowls with crusty sourdough bread. If you're new to the Instant Pot & Lamb, these recipes should get you started! But if you're a seasoned Instant Lamb cook, let me know how you like these! Do you have an Instant Pot? Comment below with your response! THIS is why you need to know your farmer! As I was scanning the news a few weeks ago, I came across a shocking article about sheep. Apparently, sheep are regularly transported live from Australia to the Middle East, crammed in cargo ships in deplorable conditions. A high percentage of the sheep are dead on arrival. This isn't just a meme or a mantra. It really matters that you know who is producing your food! When our food is shipped across the country, or in the case of lamb, from the far side of globe, how do you really know what is going into it? Peachy & son. Our lambs are raised with their mothers, not in a feed lot. Is it really grass fed? Are they pumped full of chemicals? Or finished in a feedlot? Observation is one of the best teachers. You can visit the farm where your food is raised and learn about all that goes into raising lamb (or anything you eat!). You will learn what questions to ask and what conditions to look for, and what is important to you. You can see the grass here is green and lush. You can see the flock is healthy and well cared for and you can hear us call each of the cows, sheep, and chickens by name. Some of our ewes and lambs on lush, well managed pasture. When the farm & farmer are open to visits and responsive to your questions, you know you are getting an authentic product from someone you can trust. When I say grass fed, or no GMOs, I will look you in the eye and tell you. I’m not just a website or a grocery store sign, I am a real person right here in your town, county, or region. This one is missing in so much of our lives today, and particularly our modern food system. But to me it is the most important. We spend so much time running from place to place, grabbing a quick bite out, never taking the time to slow down, relax, and visit. And honestly, this is what I love about farming for you! I love getting to know you, meeting your children and watching them run, grow, and explore. The food I raise here at Foggy Knob Farm is raised to nourish my children as well as yours. If you are looking for high quality, delicious and nourishing lamb, we are now taking deposits for whole and half lambs. You are welcome to come here and visit the farm, speak with me and my family, and ask all the questions you want! For details on our seasonal Grass Fed Lamb, click on the link below. You CAN Get A Healthy Supper On the Table NOW! O.k. It’s nearly 6 pm and you haven’t even thought about supper. That’s me most nights during the grazing season! But we both know, eating out isn’t an option. It’s expensive and you can make it better at home. Not to mention, you’re going to have that BLAH feeling afterwards if you do eat out. I know I always do. Lamb burgers make THE BEST Summer grilling EVER! And it's quick, healthy and delicious. You’ll have no guilt eating these burgers! And lots of energy and no “Blah”! Here are 3 DELICIOUS, HEALTHY lamb burger recipes you can make for Supper NOW! No fuss here! Just lamb and the grill. Simple and delicious! Using 1 lb of ground lamb for every 4 people, divide the lamb into even portions, approximately ¼ lb each, and shape into patties. Grill on medium high heat for 5-7 minutes per side, or until desired doneness. Serve on hamburger buns with your favorite toppings! Lettuce, tomato, red onion, mustard, and ketchup! It’s the quintessential summer burger with lamb instead of beef! And it's NOT your standard Quarter Pounder! This lamb burger explodes with flavor! Rosemary, tangy lemon mayo, & sweet grilled onion make for a restaurant quality burger you can’t resist. In a small bowl, whisk together mayonnaise, lemon zest and juice, garlic clove, and chives. Season with pepper. Set aside while you make the burgers. In a large bowl, combine lamb, onion, rosemary, Worcestershire sauce, garlic, salt and pepper and mix thoroughly. Shape into four 4-inch patties. These burgers are one of our favorites! The warmth of the spices and the salty feta combine to make the perfect lamb burger! These can be served in warm pitas (although a standard bun does just fine!) with thick slices of fresh tomato, red onion, and lettuce or fresh spinach. Combine all the ingredients in a large bowl and mix well. Form into 4 patties. Grill for 7-10 minutes, flipping halfway through. Serve with your favorite toppings! Now see? You CAN get a healthy supper on the table tonight! Comment below and tell me what last minute meals you make for your family.